This reverse floor-plan Sunriver home boasts a newly remodeled lodge style with beautiful wood floors and a massive floor to ceiling rock fireplace. There's a even a private hot tub, and you'll have 10 complimentary SHARC passes. SHARC is just two miles away, and both Bend (18 miles away) and Mt. Bachelor (20 miles away) are close enough for a quick trip. The oversized couch is the perfect place to relax with family and friends and enjoy a warm fire with cable on the flatscreen TV. Use the WiFi to find a recipe, then use the remodeled kitchen, with top of the line stainless steel appliances—it's a chef's dream! There's even a gas grill and dishwasher. This home includes four bedrooms and three-and-a-half bathrooms, with two master suites, each including a king bed. One of the masters is on the main level and the other is downstairs. There are two other bedrooms downstairs, one with a king, and the other with two log-framed pyramid bunks. Both have a double on the bottom bunk and a single on the top bunk. There are flatscreen TVs in every bedroom. This home sleeps up to 10 guests. The upstairs deck is huge and perfect for sunbathing, relaxing, or having a family meal on a hot summer's evening. The hot tub is downstairs with access through the laundry room. There's a private washer and dryer for your convenience. Spend glorious afternoons on SHARC's tubing hill and pools, or play championship golf at one of two nearby courses. If you're feeling sore, book a massage at Sage Springs Club Spa! This Central Oregon vacation home perfectly balances comfort and beautiful nature. Parking Notes: Vehicles are to be parked in the driveway or garage only. Roadside parking is not allowed anytime/anywhere in Sunriver without prior approval from the Sunriver Police Department. To request special permission for overflow street parking, please call (541) 593-1014. Overnight requests will not be granted. Recreational vehicles (boat, motorhome, snowmobile, ATV, travel trailer, etc.) are allowed at single-family dwellings in the driveways ONLY for the first 48 hours. After 48 hours, the Sunriver Owners Associations (SROA) storage facilities must be used. Both storage areas are fenced, locked (a key code is required), and accessible 24 hours a day. Reservations must be made prior to your arrival. To reserve a short-term RV parking space, please contact the SROA Monday-Friday, 8:00 am to 5:00 pm, at (541) 593-2411, or toll free at (888) 284-6639. Please note, camping in a recreational vehicle is not allowed in Sunriver. It was an absolute pleasure hosting you, Nicole! We are glad that you enjoyed this home and the location. We appreciate your feedback, and our management team will check to see that the stove is working properly for future stays. We would love to accommodate you for your next getaway! Great home and excellent location. Great to have such a nice home in a central location. Thank you so much for taking the time to leave a review of your stay with us. We are glad our property falls in your top 10 in Sunriver! The batteries in the smoke detectors have been replaced. We hope to host you and your family again soon. 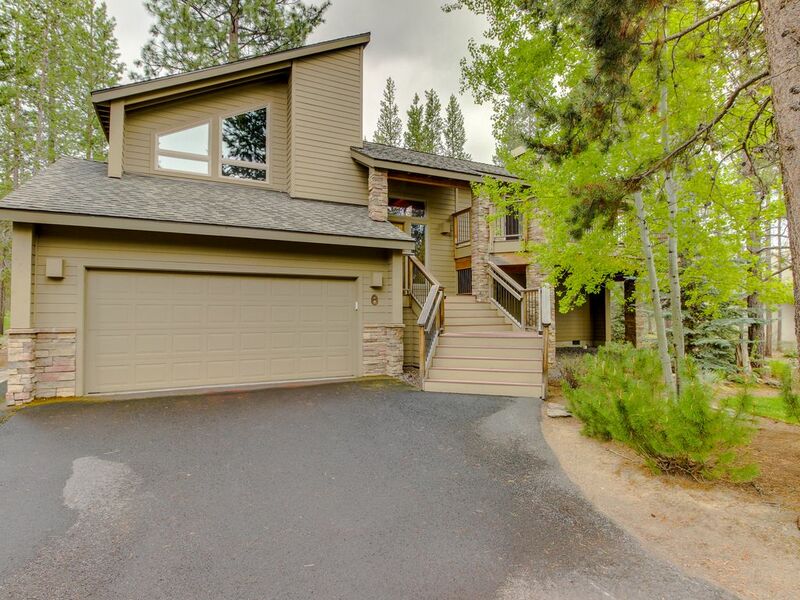 Beautiful house close to the Sunriver Resort. Hosted a girls weekend getaway and the house suited our needs perfectly. There was bed space for all 10 guests and the spacious living room/seating area was perfect for playing games and relaxing. We had a wonderful time! Everything was high quality and well equipped. Great space forthe whole large family to get together and play games anf loved that shark passes were included. We had a wonderful stay! Two adults and 3 college aged kids. The beds were all very comfortable. We had everything we needed! There was plenty of soap, linens, TP, paper towels, dish soap, laundry soap etc. There were plenty of movies, games, puzzles to enjoy. The home was very clean and comfortable! We were very impressed! !